I'm so proud of this one that it gets it's own thread. Without going into too much of the details...a fully-grown Irianta reference in one form or another has been in the works for longer than JF has existed...most of them scrapped and started over. So, for us, this is a Very Big Deal. What happens when fren get their little hands on him. Credit for the chest-part goes to the centaurs of Everquest II. And something slightly less likely to horrify the human natives (but only barely...). Your work is great, as always, Foxeye. I'm especially impressed with your fur renderings. The body mechanics of Irianta remind me of the race from "Avatar" a bit. Maybe you should demand royalties from James Cameron. YAY A new Page This is Gorgeous! Huh... interesting designs on the clothing. 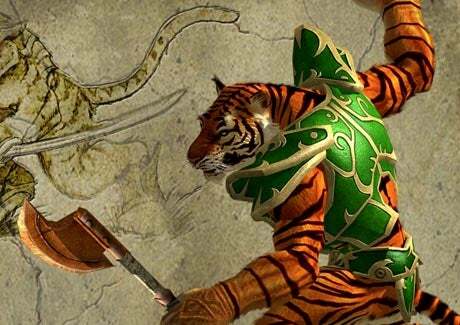 The green one reminds me of the tiger men in Titan Quest. Wha-?! I absolutely missed the new page! Wow! Vii's scales are getting so good! It must be quite time-consuming to draw them. And of course I love (and am envious) the shading of the scene in the woods. I hope it won't take another year until the next page. Aye, the scales are pretty time consuming, though not as much as grass. I dream of the day that I can draw her wearing clothes. I couldn't help thinking of Vii when I saw the awesomest dragon ever, Toothless (from How to Train your Dragon). Vii would not be amused that he is so much cuter than her. Too cute! I have missed this one before. I like Toothless's design and your interpretation even though I haven't seen the movie. But, however, Vii's design is way more elaborative. Of all of Irinata's outfits, I like the human one best. I've been a fan of your comic since 2009, though at that time I didn't realize you was the author. Silly me. Vii's scales are absolutely awesome. Anout Vii, another thing I like is how she refers the fere as furries. Little disrespectful, and nice touch. Yeah, husband Kael and I are the creators. We didn't intentionally choose the word "ferenabu" as something that could be made into "furry" by slang, but once we noticed, we couldn't resist the chance to poke a little fun at furry-phobes. I'm quite sure that a lot of the furry haters are that because they've been traumatized by the furbies. Nothing wrong about them, but even I who aren't scared that easily shudder at the commercial where a a female human gave birth to one. I wish I was sure that's all it was. I think some people just want a subgroup to be afraid of. It's less and less OK every day to hate gays, so furries became the new "freak" to target. Or that was my theory anyways, when I was trying to understand why so many people didn't want anthro-races in video games because it would attract "THOSE kinds of people". I was all "Kitties! Cute!" and they were all "OMG, pervert!" and I was all "Wha...??" Personally I find the idea of elf hybrids, to take that example fascinating. Especially the inner conflicts they face (Timmorn's and his daughter's struggle to find balance.) The creating part, I can see how thinking about it might freak some out. (Especially one of mine, Carneek, the half forest pig.) But creatures in other works, who says that antro beings have to be human hybrids? If that is what concerns them? Because in those cases I don't see arguments speaking for their case. I am LOVING the way the story is filling out! cant wait to see more foxy! Is he pulling her up or is she yanking him down? Oh, how I love these dynamics and their expression! You seem so comfortable at drawing your characters. And their proportions don't seem easy to draw... so just wow! Will there ever be a conclusion to the Red Bull debate?